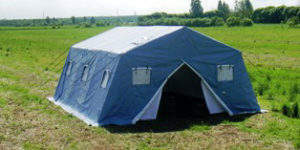 for trading, as well as skeleton awning constructions. world-renowned organizations such as UN, the International Federation of Red Cross, UNICEF and varies NGOs. poles), so that they remain steady in windy and stormy conditions. regions) and a groundsheet made of PVC or high-density polyethylene. should not require any manuals. frame are the same size and design. 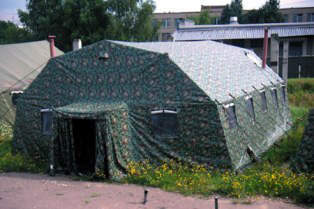 The inner awning is made of cotton, and the outer awning of PVC fabric or canvas. mosquito netting and sun-proof curtains, two entrances with or with out lobbies and allowance for heater and air conditioning. 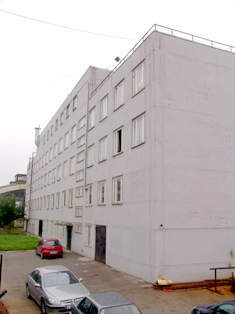 Collapsible buildings may be used to build temporary storage places, huge trading markets, ice-skating rinks, car parking, cinemas or exhibition halls. Dimensions of the collapsible buildings can be up to 20m wide. There are no restrictions in length and apex height can be up to 5m. As in all our products, constructions are consistent of similar departments. constructions. We can print any type of logo on the awning surface.